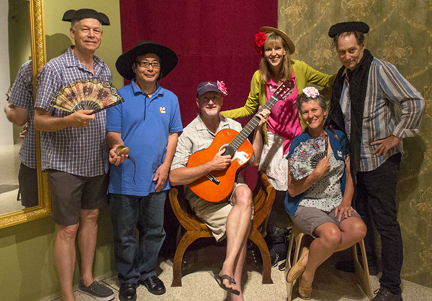 The members of the SISD went to see the Sorolla and America and Spanish Sojourns: Robert Henri and the Spirit of Spain shows at the San Diego Museum of Art: http://www.sdmart.org/art/exhibit/sorolla-and-america. They had a little section where you could dress up, so of course we all dressed up for the photo. The Sorolla will be up until August 26th 2014. If you haven’t gone, don’t miss it! It was stunning. The best art show I have seen in a long time. (l. to r.): Tracy, Paul, Dan, Lori, Kim and Ken.